Compact cassettes were in great demand from 1970s to 1990s and so were cassette tape players which were used to play them. But, gone are the heydays when cassette tapes used to play magic in the house of almost every music lover. Basically the magnetic tape recording format is no more interesting and cassette tape players are nearly extinct and outdated. However, if you have still preserved the cassette tapes containing your favorite memorable songs, you don’t need to be disheartened that you cannot play them anymore. Now, it is possible that you digitize your cassette tapes and listen to your classic song collection by using Alesis’s TapeLink, a USB tape deck. 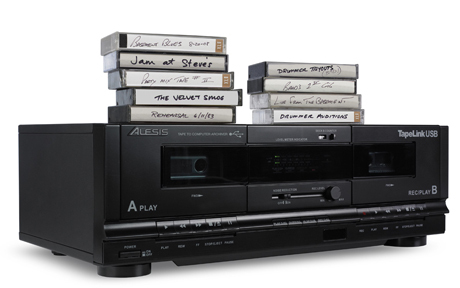 Alesis’s TapeLink is a dual-cassette deck that delivers a CD-quality digital-audio output through USB. This excellent converter has ability to convert or digitize your magnetic tape format cassettes and efficiently store your exceptional recordings on a hard disk or flash. You may also burn your favorite songs to a CD or transfer them to your iPod. To record the recordings to your system, you simply need to connect TapeLink to your PC and play a cassette tape. This digital archiver delivers digital-audio output at 44.1 kHz (16-bit) which precisely captures tape recordings to ensure safe digital archival. TapeLink USB is equipped with a software suite that contains three applications namely, BIAS SoundSoap™ SE software, EZ Tape Converter and Audacity audio-editing software. BIAS SoundSoap™ SE is noise- reduction application which efficiently removes any kind of hiss, rumble, room noise, electrical hum or any background noise. EZ Tape Converter enables easy and convenient transfer and Audacity audio-editing software allows you to perform basic modifications. Alesis TapeLink works with most Windows Operating Systems as well as Mac OS X. The key features of this brilliant tool are listed below. A simple plug-and-play (PnP) USB interface that does not require any drivers. Saves a lot of time with its high-speed and normal dubbing modes. Offers a CD-quality digital-audio output at 16-bit, 44.1 kHz. Cleans up old tapes with active noise-reduction software. Has ability to work with CrO2 as well as metal tapes. Contains software suites such as BIAS SoundSoap SE, EZ Tape Converter and Audacity. Its full auto-stop prevents breaking of aged tapes. Offers a quick visual reference with the help of LED level meters.